Rowville Eagles F.C. was founded by Romanian immigrants at the beginning of the 80’s and played it’s first games in East Carlton. 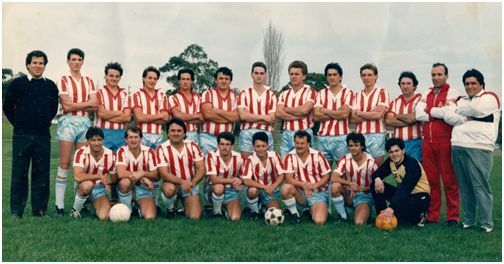 A few years later the club moved to the South Eastern side of Melbourne where was known as Dandy Dynamo, Banatul Melbourne and Melbourne Romania. 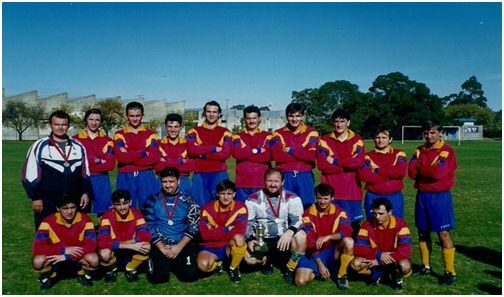 It was the time when the club started to attract more and more supporters from the Romanian community but also other football lovers from the Dandenong region. Stefan Jurj, Cristi Georgescu, Constantin Iliuta, Doru Dodenciu, Ion Puscas, Adrian Muntean are some of the players that played in those times. In 1992 the club became Division 2, Amateur League Champions under the name Melbourne Romania, and gain promotion to Division 1. Titi Schioparlan, Jiva Mihailovici and Stefan Virgil were the at the helms of the club in that year and Cristi Georgescu, Ioan Puscas, Petru Gross, Stefan Jurj,Constantin Iliuta, Doru Dodenciu and Florian Puscau were among some of the players that achieve the promotion. Three years later the club officially changed it’s name to Rowville Eagles S.C. It was the beginning of a new era for the club who will achieve a lot of success. 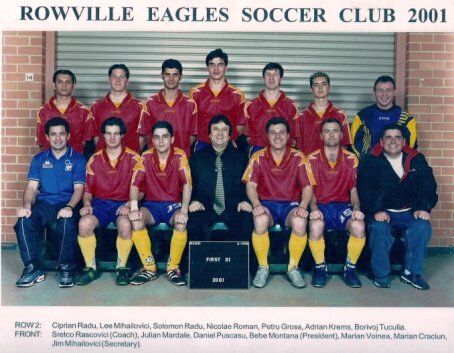 In 1998 Rowville Eagles finished second in the Division One and obtain promotion in the Provisional League 3.It was a great achievement by the club and the players. Also in that year the junior sides from Rowville Eagles produce some quality players that will play senior football in the following years. Playing in Provisional Leagues during the next 10 years will bring a lot o success to the club. In 1999-2000 Rowville Eagles finished 7th and 8th in the League. 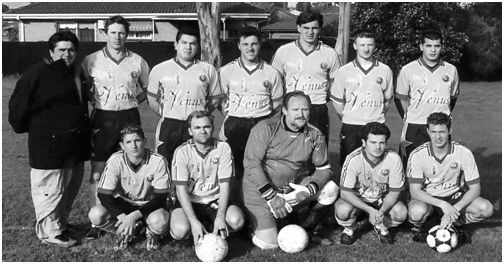 2001 was the year when Rowville finished second on the ladder and gain promotion to Provisional 2 South-East. 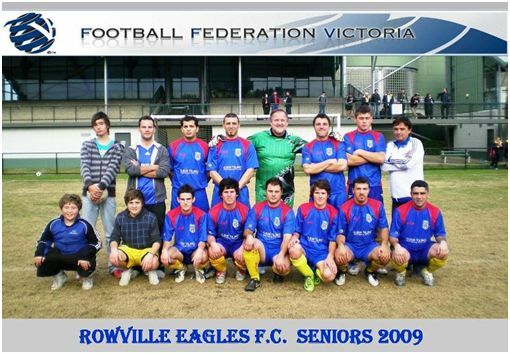 Winning 14 of 22 matches and scoring 72 goals that year, Rowville Eagles was the most exciting team to watch. Playing attacking football and scoring lots of goals, The Eagles managed to entertain the fans for the whole season. In 2002 Rowville Eagles manage to become the Champions of Provisional 2 South East. With 17 wins, 1 draw and 4 loses, scoring 69 goals and only conceding 21, the boys finished first in the league. Rated as one of the best sides that ever played for Rowville and surely the most popular in the hearts of our supporters. 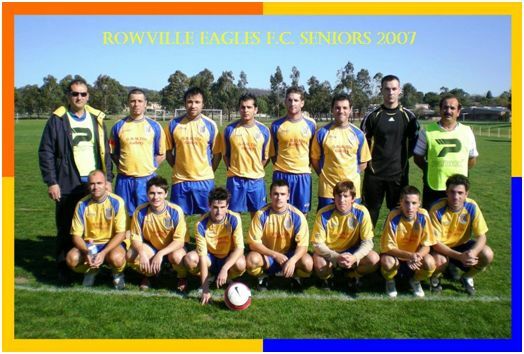 From 2002-2007 Rowville Eagles played in Provisional 1 South-East league. It was a tough 5 years in the existence of the club. The Eagles never finish higher then 9th on the table and were always engaged in relegation battles. Always fielding a young and talented side, it was very hard to compete against experienced and mature teams who were always looking for promotion. 2004 was a sad year for everyone at Rowville Eagles as we lost George Buttinger our honorary president and also the most loved and respected man in the history of our club, Jiva Mihailovici. It was a hard year and most of the players and supporters were marked by the loss. During these 5 years Rowville Eagles junior’s sides coached by Nelutu Negritas and Constantin Iliuta become champions in their leagues. Some of those players are currently still playing for our club. The 2007 side was very talented and hosted some great young players like Paul Maghiar, Michael Voinea, Ross Jurj, Daniel Negritas, Vlad Vasilciuc and also some of the old brigade like Marian Craciun, Marian Voinea, Svetozar Radu, Daniel Puscasu and Michael Burhala. In that year Rowville Eagles coached by Doru Maghiar finished 9th with 6 wins,8 draws and 8 loses and a minus 8 goal difference. In 2008 was the worst year in the history of Rowville Eagles. Loosing most of their senior players for the second half The Eagles played with the junior side in the last 10 games of the season. There were a lot of heavy loses during that year and the boys only manage 10 point for the whole season. Finishing 11th on the ladder with 3 wins, one draw and 18 loses also having a minus 82 goal difference, Rowville Eagles headed for Provisional Two after 5 years. The 2009 season was another hard year for Rowville Eagles. With a young and inexperience squad The Eagles struggled for the first half of the season, managing on 2 draws. In the second part Rowville started to win games and playing some good football. But it was not enough, and at the end of the season with 4 wins, 3 draws and 15 loses, Rowville Eagles finished again 11th on the table and were relegated to Provisional Three. Rowville Eagles F.C. is currently looking for businesses to get on board and become a sponsoring partner for the upcoming 2019 season. Level 1 Alcohol Policy Rowville Eagles F.C. Level 1 Smoke Free Policy Rowville Eagles F.C. Rowville Eagles F.C. would like to thank Knox City Council for all the support during the last 20 years.